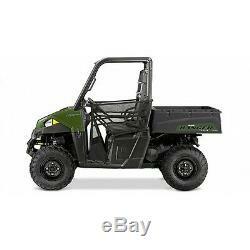 Polaris Ranger 570 - Sage Green (EU). This machine now comes with a Sport Poly Roof (2883236) and a Poly Rear Panel (2879812). EU Package comes with indicators, manual handbrake, mirrors, side-mirrors, horn and number plate provision. This make the Polaris agriculturally road registered, allowing you to travel upto 1.5 miles on the road from the border of your land. Get More Done Around Home or Property. Powerful 44 HP ProStar® EFI engine. Increased Suspension Travel and Refined Cab Comfort, Including Lock & Ride® Pro-Fit Integration. The RANGER 570 ProStar® engine is purpose built, tuned and designed alongside the vehicle resulting in an optimal balance of smooth, reliable power. The ProStar® 570 engine was developed with the ultimate combination of high power density, excellent fuel efficiency and ease of maintenance. 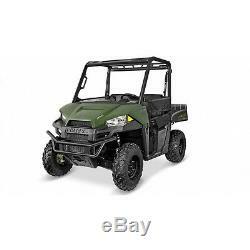 Featuring a powerful 44 HP ProStar® engine that leaves the utility side-by-side competition in the dust 22% more than the 2014 Honda Pioneer 700. RANGER 570 delivers more torque and rear wheel pulling power to get the job done. Now with 20% more towing capacity 1,500 lbs. And standard 2 receiver, RANGER 570 allows you to tackle the toughest jobs with confidence. Additionally, a 1,000 lbs. Payload capacity is highlighted by a rear box with gas-assist dumping operation that can tote up to 500 lbs. With the Polaris true AWD advantage, all four wheels engage automatically when your vehicle needs more forward traction and reverts back to 2WD when it doesnt. When in 2WD, the VersaTrac Turf Mode switch unlocks the rear differential for easier, tighter turns that wont tear up your lawn. RANGER Works on Your Schedule. RANGER doesn't stop working when the sun goes down and is there for you before it rises. RANGER 570 features 50W headlights versus 37.5W for the competitors and our LED rear lights out shine the others too. We designed RANGER 570 with an ideal seat height combined with wide foot clearance for easy entry and exit. Plus, experience updated bench seats engineered for all-day riding comfort and standard tilt steering wheel adjustment! To ensure a smooth ride, RANGER 570 features a full 9 (22.9 cm) of suspension travel up front and 10 (25.4cm) of Independent Rear Suspension travel an increase of 11% to the rear wheels. This is 25% more than the closest competitor in the class. Additionally, a 58-inch width allows RANGER 570 to fit in the bed of most full-size pickups. RANGER is engineered to make maintenance quick and straightforward in your garage with easy to access service points for the oil filter, dipstick & drain plug. The Polaris Engineered PS-4 Extreme Duty and PS-4 Oil Change Kits are engineered to offer the right protection for your engine, the right amount of oil and the right filter to get the job done fast so you can get back to riding. Full Line of Polaris Engineered Accessories. Make your RANGER even better with Polaris Engineered Accessories. With more than 350 accessories available and Polaris-exclusive technology like Lock & Ride®, you can feel confident that Polaris Engineered Accessories will improve your ride, from the back yard to the deep woods. On-Demand True AWD/2WD/ VersaTrac Turf Mode. MacPherson Strut 9 (22.9 cm) Travel. Dual A-Arm, IRS 10 (25.4 cm) Travel. Bed Box Dimensions (L x W x H). 32 x 42 x 11.5 (81 x 107 x 29 cm). Front/Rear Rack or Box Capacity. /500 lb (226.8 kg). 9 gal (34.1 L). Overall Vehicle Size (L x W x H). 110 x 58 x 73 (279 x 147 x 185 cm). 1,000 lb (453.6 kg). 1,042 lb (473 kg). Cargo System - Lock & Ride. Colour / Graphics - Sage Green. Electronic Power Steering - Not Equipped. Hitch Type - Standard/2 Receiver. Instrumentation - Digital Gauge, Speedometer, Odometer, Tachometer, Tripmeter, Hour Meter, Gear Indicator, Fuel Gauge, Hi-Temp, DC Outlets (1). 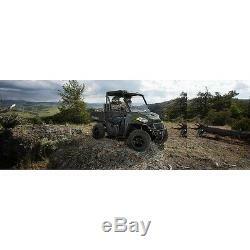 Lighting - 50W Headlight, LED Tail Polaris. Pro Fit Cab System - Standard. Bodywork In-mold - Sage Green. That's 30 years experience in the industry. We have plenty of other stock to choose from. We also supply new machines. With hundreds of models in stock to choose from we believe you won't find a better range of gardening equipment. 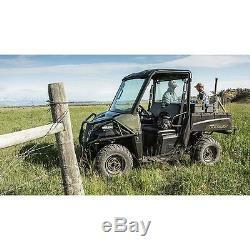 The item "Polaris Ranger 570 EU Agri Road Legal UTILITY VEHICLE/ATV/QUADBIKE/TRACTOR" is in sale since Monday, March 19, 2018. This item is in the category "Business, Office & Industrial\Agriculture/Farming\Other Agriculture/Farming". The seller is "seagem50" and is located in Congleton, England. This item can't be shipped, the buyer must pick up the item.